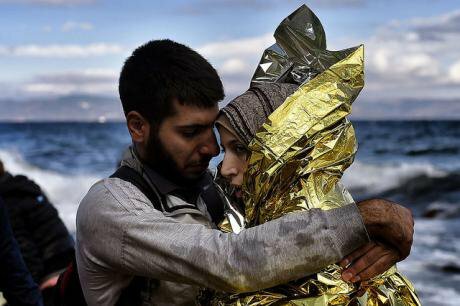 Two refugees arriving on the island of Lesbos after crossing the Aegean sea from Turkey on September 30, 2015. Flickr/Jordi Bernabeu Ferrus. Some rights reserved.A few miles out of the main port of Mytilini on the island of Lesbos the EU’s new deal with Turkey on refugees has a visible and appalling face. Along a dusty road, Moria camp – a closed, badly overcrowded, ‘pre-removal detention centre’ – represents all that is wrong about the EU’s response to the refugee crisis. It is a grim camp, surrounded by barbed wire, and high fences, with grey containers inside, and women, men, children and babies all crowded in together – 2,800 people in a camp meant to hold 2,000 at most. Here, in this valley dotted with olive trees, the EU appears visibly to have lost its morality and humanity. There is a large blue police bus outside the main entrance, riot shields propped up against the side, police wandering around, waiting. I make my way to the far side of the camp where I manage to speak to some of those inside through the fence. This was last weekend, before police at the camp began to stop journalists and human rights observers even talking to people. One asylum-seeker showed me video footage on his phone of a mass fight, apparently in the food queue, last Thursday. There is insufficient food in the camp - a shocking fact - and due to the overcrowding, people are sleeping on blankets on the camp's bare ground. There is insufficient food in the camp, and due to the overcrowding, people are sleeping on blankets on the camp's bare ground. I talk to a few refugees from different countries – including Syria, Afghanistan, and the Democratic Republic of Congo. They all express the same incredulity that the EU could behave in such an inhumane manner, and that people fleeing conflict would be locked up by the EU in such bad and overcrowded conditions. There are old people here – UNHCR spokesman Boris Cheshirkov talks to me about one 93 year old woman. He says there are 17 pregnant women in Moria camp, other women are breast-feeding, there are toddlers and even babies locked inside. Michele Telaro, from Medecins Sans Frontieres, is most concerned at the very vulnerable people inside Moria – those with psycho-social problems, chronic illnesses, children, the elderly – “minimum humanitarian standards are not being respected and security [for those inside] is a concern”. Cheshirkov is worried that many of these people have suffered severe, and traumatic stress, and that being incarcerated could bring post-traumatic stress symptoms back. The asylum-seekers I talk to are very clear that they are in prison. In a further act of discrimination, a group of Pakistanis had been locked inside a more secure area in the camp, separated from the other asylum-seekers – it is this group that are believed to have been deported this morning back to Turkey. UNHCR spokesman Cheshirkov says that 2000 of the 2,800 inside Moria have said they wish to apply for asylum. How long this will take and how fair it may be – especially when the EU’s aim is to return everyone coming from Turkey – is at best an open question. For now, the Greek asylum service has nothing like the capacity needed, and the EU has failed to send the numbers of experts it has promised. There are 3 asylum case workers inside Moria at present. The Greek asylum service has nothing like the capacity needed, and the EU has failed to send the numbers of experts it has promised. MSF’s Telaro is concerned at how the asylum processes will unfold – will requests for family reunification be allowed or not? If not, and people are sent back to Turkey, the possibility arises of those with family members already in EU member states nonetheless going to the back of the queue in Turkey. Telaro also stresses that the EU cannot reasonably send Afghans and Iraqis back to Turkey as it does not even offer them the minimal ‘temporary protection’ that Syrians can access there. Whether the EU will nonetheless deport people from these countries in the coming days and weeks if their asylum claims are rejected remains to be seen. The UNHCR has asked the authorities to move all vulnerable people and all children from Moria camp to the second camp on Lesbos called Kara Tepe. This camp is an open camp, well-serviced, with the main humanitarian groups there (who have withdrawn from Moria unwilling to collude in mandatory detention). But so far, the punitive overcrowding continues at Moria, even for children, with just 8 families moved to Kara Tepe according to Boris Cheshirkov. The vast majority of arrivals in recent months have come from three countries beset by conflict – 45-50% from Syria, around 25% from Afghanistan and 18-19% Iraqis. Yet even those who arrived before the cut-off date of 20 March imposed by the EU face an uncertain future. With 50,000 refugees in Greece, since the Greece-Macedonia border was closed, and 30 camps across Greece, it is unclear when and how the over-stretched Greek asylum service will deal with requests under the EU’s relocation scheme. This scheme, after 5 months, has anyway relocated less than a thousand people from Greece (probably nearer 600). This scheme, after 5 months, has anyway relocated less than a thousand people from Greece (probably nearer 600). At this rate, it would take decades for people to be relocated. Yet there is no palpable sense of urgency – the EU’s priority is removals from the islands back to Turkey, not rapid and humane relocation and family reunification. Afghans are not eligible for the relocation scheme, a decision of the EU’s leaders. The EU set a discriminatory barrier that only nationalities with an EU average of over 75% of asylum claims being successful would qualify for the scheme, and Afghans at 65% do not. But Syrians and Iraqis languishing in appalling conditions at Idomeni, on the border, or in Pireaus port in Athens, may be forgiven for not seeing themselves as lucky. UNHCR regional spokesman Babar Baloch says so far “there has been a lot of responsibility shifting”. It is clear no one wants to take the blame for the chaos and humanitarian crisis in Greece. Yet Baloch seems clear that it is the EU that is failing to step up to the plate – that Greece has the willingness but not the capacity to establish all the camps needed, and process all the asylum and relocation applications, and that the EU is failing to deliver – “The EU needs to step forward and help Greece – Greece can’t be left alone to deal with all this”. 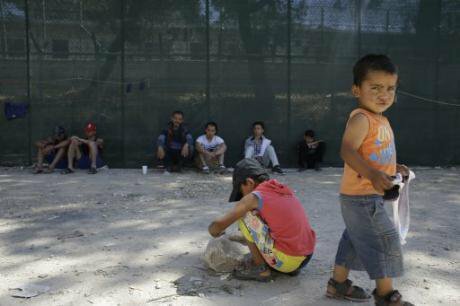 Moria camp on Lesvos, June 17, 2015. Thanassis Stavrakis/ Press Association. All rights reserved.